One of the problems with living in Atlantic Canada is that very few big acts perform here; most "national" tours don't come east of Montreal. Which is why several thousand aging metalheads -- including me -- turned out on the 10th to finally welcome Judas Priest. Priest's breakthrough came in the late 70s, and some argue their popularity peaked in the 80s -- but 45 years of delivering top-notch metal to generations cannot be dismissed that way. The music that grew out of the English industrial centre of Birmingham was the opposite of the hippy-hope tunes. The desperation and drudgery of poverty fuelled a sound that spoke to the working-poor and unemployed -- which is why heavy metal is still hugely popular in places like the Atlantic provinces. Judas Priest are no tired has-beens. They are the tough Old Guys we see in sheds all over, the masters of their trade. Lights down; stage blocked by a massive black banner with the silver Judas Priest gothic logo. The opening chords of Dragonaut rang out. As the curtain fell, the stage erupted. Priest hit like a demolition shockwave. The crowd rocked back on its heels, then surged forward behind raised fists. No release of pent-up anticipation, it was defiance against a force of nature. The LED screens spewed volcano fire. Rob Halford snarled into the mic with his unmistakable voice. For the entire show, the power didn't let up. Fourteen songs -- including the 10 minute plus You've Got Another Thing Coming -- and two encores of aftershocks. By the end, the audience has been beaten into submission. Following a respectful but wore-out standing ovation, we all filed out, every bit as exhausted as the band. We had been pounded into the ground by the Old Guys. These seniors -- and they are retirement age -- had just turned us into mush. Speaking of retirees: founding member K. K. Downing retired from the band in 2011. Like the other working men his age, he laboured hard for 40 years and is enjoying his rest. His replacement, Richie Faulkner, fits in perfect. A sprightly 35, Faulkner cut his teeth on the band and fans won't be disappointed. A long solo demonstrated his skills without being boring and the power he delivers matches Glen Tipton the same way Downing does. The solo trades offs and dual guitar work is dead on. Four songs in, Priest launched into Victim of Changes. Written in 1976, the song is a showcase for the band. Timing changes show off the versatility of the rhythm section. Guitars duel over the complex interwoven guitar lines. Rob Halford's famous vocal range gets full force, shifting from growling lows to crystal-shattering highs. In 40 years, Halford has only improved at singing this song. He held notes so long we were wondering if we needed to call an ambulance. Halfords's Dragonaut full-trench sported a Royal Canadian Legion poppy, showing respect to the Fallen the night before Remembrance Day. It matched the ones in our own jackets. The tech people made excellent work of the screen-backdrop: album covers meshed with FX lighting, live action cameras, and fantastic videos. Screens become torch-lit Halls of Valhalla. Yes, the motorcycle came on for Hell Bent For Leather, with the screens flashing biker patches. (Speaking of which: I couldn't quite pick out the words, but I swear one of Halford's biker patches read "Metal Gods, St. John's, NL". If anyone can confirm/deny this, let me know.) Screaming for Vengeance used scrambled lyrics projection -- a la thriller film Seven - and ended with a close-up of Rob screaming that brings chills. Security was watchful, especially as the front several rows were mostly teen fans. 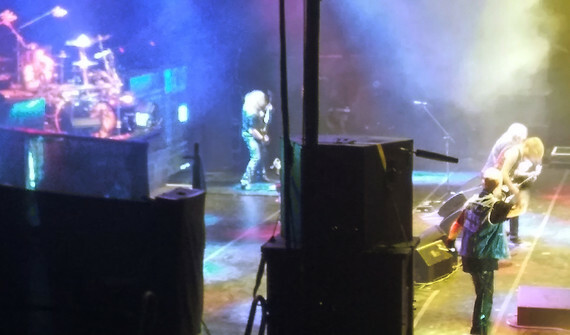 That didn't stop the middle-aged guy in his original studded denim vest, complete with Screaming for Vengeance back patch from leaping the gap and getting on stage. Even the band looked stunned. We cheered because he was one of us -- an adult channeling his youth. Halford apologized on behalf of the band for taking so long to get here, which we all appreciated very much, since we've been waiting patiently. Apparently, Ozzy sent us the Priest. Rob promised they'd return soon and we anxiously await the dates. Finally, big kudos to Mastodon, the openers. I'd never heard them before but their style is a great match for Priest. Bands opening for legends frequently get a raw deal. Everyone knows the headliner is the real reason they are there and that's a steep hill to climb to get attention. Mastodon not only gave a first-rate performance, they did so in a way that was respectful but not overshadowed by their elders. Mastodon rocket up that hill alongside Priest. Judas Priest are the Harley softails; Mastodon are the crotch-rocket rice burners. Both get your attention but for slightly different reasons. If you're a first-generation banger who tuned out in the 90s, this is a band to check out.